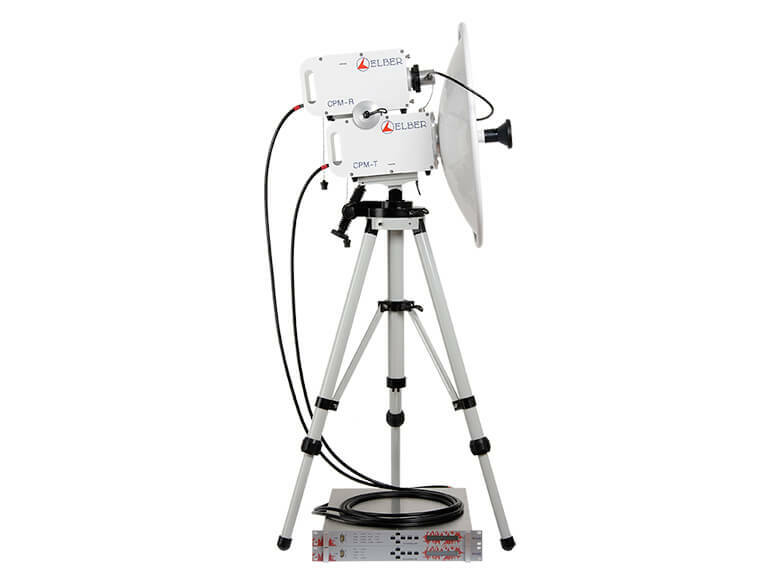 CPM is the portable multi-channel microwave radio system, the working frequency can be any 500 MHz band between 2 GHz and 15 GHz and the modulation can be either analogue (FM) or digital (COFDM). An external IF input for different or back-up signals is also available. These features makes the CPM the ideal equipment for fast and reliable mobile links, even in hard weather conditions. The COFDM section includes a SD 4:2:0/4:2:2 encoder with a low delay mode of less than 95 ms. In addition, an FM modulator and demodulator realised with Software Radio Technique are provided. The output power, depending on the frequency band, can be 1 W, 2 W or 4 W. The system can be composed of indoor and outdoor units or outdoor units only. The outdoor equipment is composed of a Tripod complete with Panoramic Head, Base Plate, Orthomode Transducer, Parabolic Dish complete with feeder and one or two RF Heads. The outdoor control units have the same dimensions of the RF heads and can be placed under the equipment, connected through a RG-216 cable. The indoor control units are 1U 19" standard rack and can be lodged in a van. The weatherproof RF heads that can be installed on the base plate can be (depending on the application) single Transmitting or Receiving Head (Simplex), two Transmitting or two Receiving Heads (Double Simplex) or a Transmitting and a Receiving Head (Duplex). Audio Inputs: 2 channels analogue, 2 channels AES3 or SDI embd.